"Great Christmas gift! 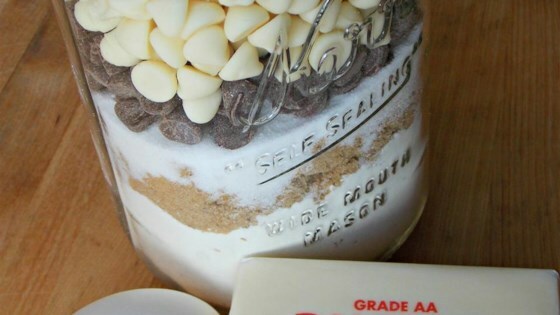 Layer dry ingredients in a jar and add a tag with instructions: Add one stick of butter and an egg; mix and bake at 375 degrees F (190 degrees C) for 10 minutes." Whisk flour, brown sugar, chocolate chips, white chocolate chips, white sugar, baking soda and salt together in a bowl. Stir butter and egg into flour mixture until dough is just mixed; drop by the spoonful onto a baking sheet. Bake in the preheated oven until edges of cookie are lightly browned, about 10 minutes. Great recipe, but we also had 1/4 cup Rice Krispies in ours, which adds a nice texture to the cookie!